While information technology may be advancing exponentially—the pace of the space race has seemed glacial since the 1970s. By now, most of us are used to a top-down, monolithic model of space exploration with associated costs liable to make Dr. Evil blush. The message? Space exploration is not for you. But a new generation of space startups is aiming to change all that. It’s the people’s space race, and companies like San Francisco’s NanoSatisfi dream of making space exploration affordable and accessible for students, researchers, and hobbyists. While SpaceX grabs glitzy headlines by lowering launch costs (who doesn’t like rockets? ), NanoSatisfi is working the other end of the equation. How to increase the efficiency of every pound we send up—and how to better harness the market to innovate further improvements. If all goes to plan, NanoSatisfi will have supporters of their Kickstarter sensation ArduSat snapping photos, uploading applications, and running experiments from orbit within a year. Singularity Hub asked Peter Platzer, co-founder of NanoSatisfi, to elaborate when we sat down with him at NanoSatisfi’s headquarters recently. NanoSatisfi is based out of a collective workspace provided by tech incubator, Lemnos Labs, and situated near the ballpark in downtown San Francisco. Upon arrival, one is greeted by a nondescript front door sporting a few haphazardly labeled buzzers. None smell the least bit hackerish. That’s because NanoSatisfi doesn’t have a buzzer—Lemnos Labs is in the garage. The team works alongside a number of other tech startups. One group is laboring over hamburger technology. Another has their eye on the perfectly roasted coffee bean. A third is working on commercial unmanned aerial vehicle (UAV) tech. And nestled in with the rest, NanoSatisfi is designing and building satellites. For those of us living in early 21st century San Francisco—foodies and geeks peacefully hacking high-tech in a garage is too deliciously apt to bear. After a tour to meet the team and check out the cool stuff on their workbenches, we sat down in a shared conference room and asked Platzer for his Twitter pitch. Platzer began his career as a high-energy physicist at CERN. Back then, they had a Cray computer the size of a room to do some of the most advanced physics in the world. Today, the power of that Cray sits in the palm of your hand—an iPad. 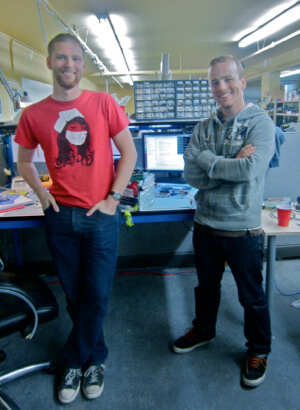 NanoSatisfi co-founders, Jeroen Cappaert and Joel Spark. Yet huge satellite projects, years in the making, rarely if ever make the most of the newest technology. Further, they are extremely costly, non-standard, and require highly specialized technical skills to build and operate. NanoSatisfi (and others) aim to tear down these barriers to entry with the CubeSat. CubeSats are standardized small satellites, 10 centimeters to a side and weighing a kilogram or less. They are cheaper to build and launch (by orders of magnitude) than traditional satellites. But CubeSats alone are still fairly expensive—a few hundred grand, all in. So, NanoSatisfi will design, build, and launch their own CubeSat—and here’s the key—with a user-programmable Arduino-based computer and a suite of 20 instruments. Researchers, students, and hackers can then rent satellite time and upload applications to the CubeSat from Earth for a modest sum. Platzer notes, “Disruptive technology makes non-users into users.” Because of the costs and technical hurdles of space exploration there are many, many non-users. Pretty much all of us in fact. But provide an uplink to a pre-fabricated CubeSat already in orbit, and you open the field to thousands. Platzer says it’s like an iPhone and app store for space-based technology. After CERN, Platzer went to Harvard to get his MBA and wound up running a $500 million quant fund on Wall Street. But space exploration called. He went back to school to get a master’s degree at the International Space University and became convinced now is a very exciting time for space exploration. A rebirth of sorts. 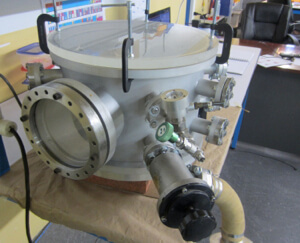 NanoSatisfi’s ArduSat vacuum test chamber. For now, the team is focused on their Kickstarter project, ArduSat—a user controlled Arduino-based computer and sensor array, housed in a GOMSpace 1U CubeSat powered by solar panels. Kickstarter supporters who pledged $150 get to take up to 15 pictures using the satellite. $325 or more reserves satellite time during which users can upload and run applications using ArduSat’s sensors. Because the Kickstarter raised more than expected—$106,330 from a goal of $35,000—they’ll build two CubeSats instead of one. And the really big news, they’ve secured launch slots for both satellites in 2013 through NanoRacks. Next the NanoSatisfi team will get down to the business of building two space-worthy satellites. And if anyone’s up to the task, it’s these guys. They’re a talented bunch—hackers extraordinaire. 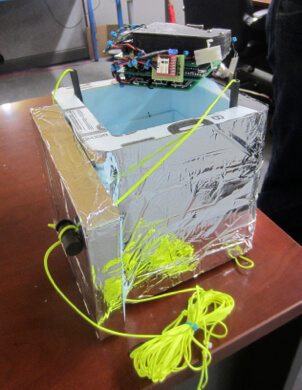 ArduSat payload and container back home safely after 85,000 foot balloon test. Jeroen Cappaert is a mechanical engineer with Arduino experience. 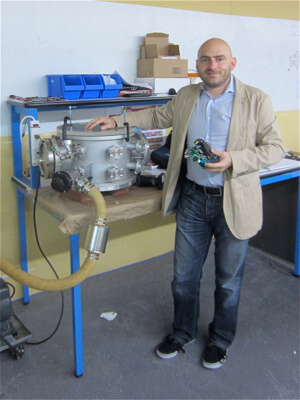 Cappaert and Platzer designed the architecture allowing ArduSat’s Arduinos to be remotely programmed in space. 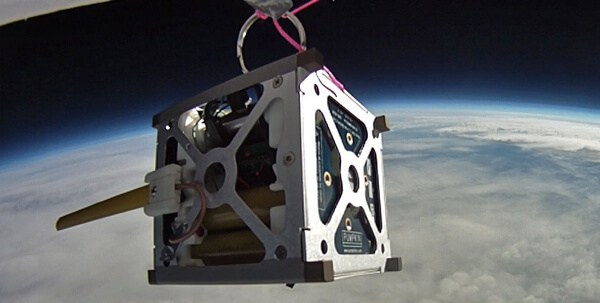 And just recently, Cappaert took the ArduSat payload on a field trip to Colorado. On October 27, in partnership with Edge Research Lab, he sent the ArduSat payload 85,000 feet up tethered to a hydrogen balloon. The test was successful, and added to the vacuum chamber test data from back in San Francisco, the team will perfect their design to ensure it is in tip-top shape for next year’s launches. Getting these first two CubeSats right is paramount. But if all goes well, they’ll continue on with the larger plan. NanoSatisfi hopes to use angel funds to expand their network of ground stations (for satellite communication), build an online interface, and sign up interested organizations to use the ArduSat model for space-based education. Next stop orbit—the more, the merrier.